In spite of Early Blight this has turned into a relatively productive year for tomatoes, not like in past years when every counter was covered with them but we still have plenty to eat and some to give away. I use a marking pen to write the variety name on the shoulder of varieties I need to taste-test. Several years ago Debbi’s great nieces were down visiting (ages 4 and 6). They were having a ball helping me harvest the produce that year when they noticed that my tomatoes had names. When the innocent little darlings came up to me—hands loaded down with tomatoes—and asked “Can we name our tomatoes, too?” Of course they had in mind names like Johnny, Sue and Trevor. What else could I say? Why yes, I said, here’s a marking pen. A couple of tomato varieties that don’t look like they will get names this year are Old German and Mortgage Lifter. Nice looking bushes but neither one has even a single green tomato on it and it’s July. Maybe if they had been planted earlier they might have fruited but I doubt they would have been very productive. Phoenix is a modern, determinate hybrid that has the best foliage in the garden and a nice crop of tomatoes. I tried it a few years ago but don’t remember thinking it was very tasty—and it still isn’t. Top Gun is another determinate tomato that is quite productive. It’s a little better than Phoenix with rather firm textured fruit. This year Big Beef has been a surprise—tasty and a nice size, big but not too big to be productive. Better Boy has been delicious as always and now that it has recovered from Early Blight it’s earning its keep. Great White has produced a great big bush with large tomatoes that tend to crack around the stem. They really aren’t white—more yellow with green shoulders and some streaks of red inside. They actually have good flavor, not really low-acid like you might expect, and they have some complex sweetness. Would I grow them again—not sure, they’ve put on a late crop and we will see how these taste. A common problem with heirlooms is a tendency to decay before they ripen because of the deep cracks at the stem end—especially late in the season. Black Krim has been small and egg-shaped, seems they were flat and round in previous years but heirlooms aren’t always consistent. We had our best BLT of the year recently. The tomato was a large Cherokee Purple—big enough that the slices lapped over the toasted white bread smeared with a generous amount of Duke’s mayonnaise. 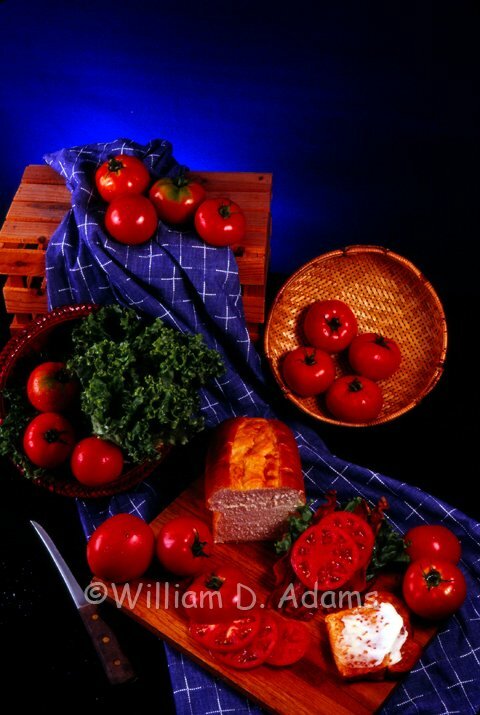 We like whole wheat and multi-grain breads but they can be too much competition for the tomatoes. 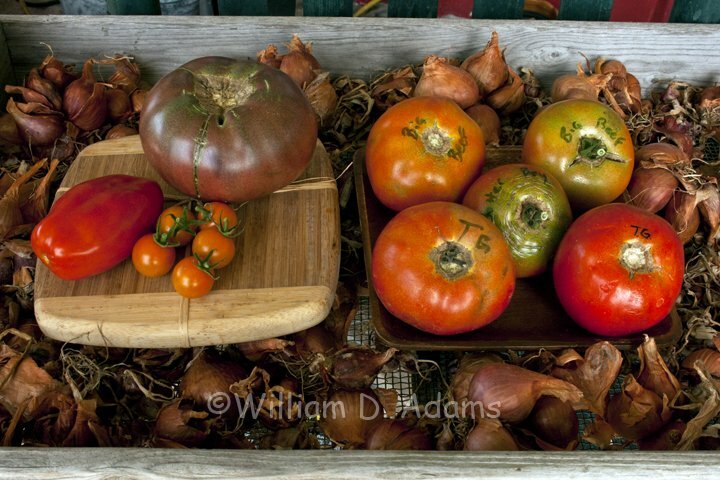 Cherokee Purple is a delicious tomato with just the right acidity and complex sweetness. We added plenty of Tony’s Creole Seasoning salt and black pepper to enhance the flavor even more. We splurged on some thin-sliced Boar’s Head bacon cut in half before frying to ensure that it comes out crisp, flat and just the right size to fit between the tomato slices and lettuce. It’s expensive, but good bacon is such a vital element in the ultimate BLT. Be sure to hold one of these beauties over a plate so you don’t drip the scrumptious juices on your clothes. If no one’s looking you can use a few pieces of bread to sop up this nectar. 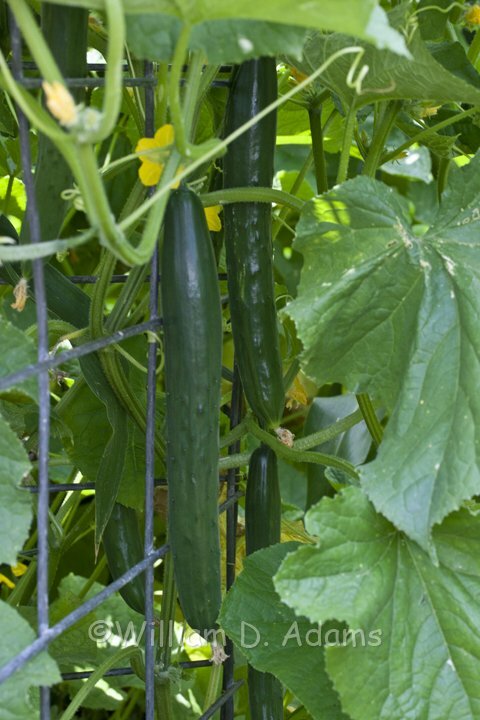 Back to the garden, cucumbers have been prolific. The burpless variety Tasty Green and the Middle Eastern varieties like Cetriolino (seeds from Grow Italian—Arbor Gate has ‘em) are producing on tomato cages. They’re delicious fresh in salads and they make good Bread and Butter chip pickles and hot dill pickle sticks. Individually they’re a little too big for jars. 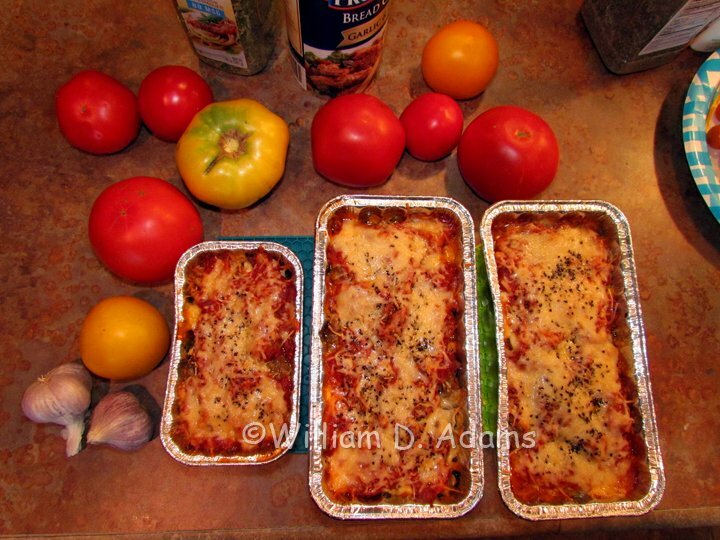 The Large Louisiana Oval Green eggplants are beginning to produce and they make wonderful eggplant parmesan. We also have one plant of the skinny little Long Purple eggplants. Both of these varieties are very tender and never bitter. 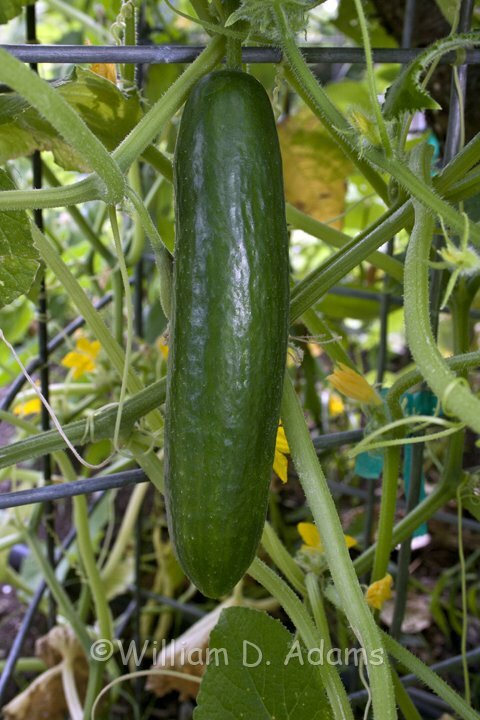 Arbor Gate has the Louisiana Oval Green eggplants available in the spring. I’ve never seen this variety offered in a catalog so once you get a plant, allow some to turn yellow and develop mature seed in the fall and save your own seed. Better yet (eggplant seed is a pain to process) check with Arbor Gate to see when the plants will be available. Some folks think the key to enjoying eggplant is to hide it in a tasty casserole or fry it up with crusty goodness. 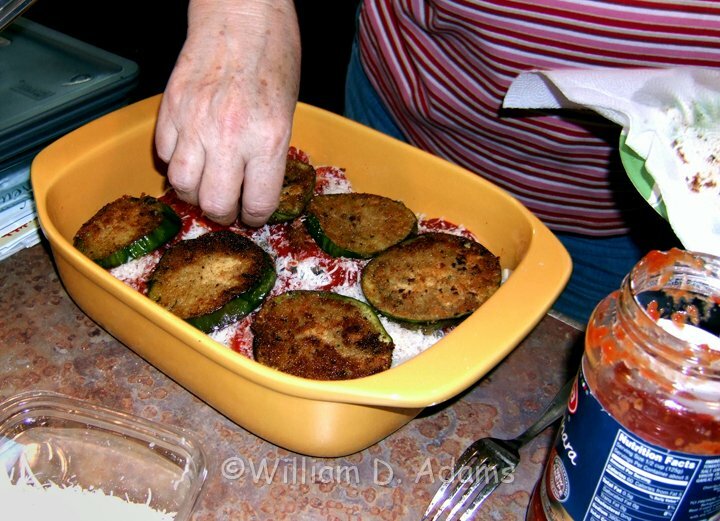 This recipe does both and even the real eggplant connoisseurs won’t be disappointed since the delicate and delicious flavors of eggplant still come through. Crumble hamburger or sausage in a medium frying pan sprinkled liberally with Italian Seasoning. Add garlic and cook on medium heat until the meat is browned. Set aside. Combine milk and egg in a bowl. 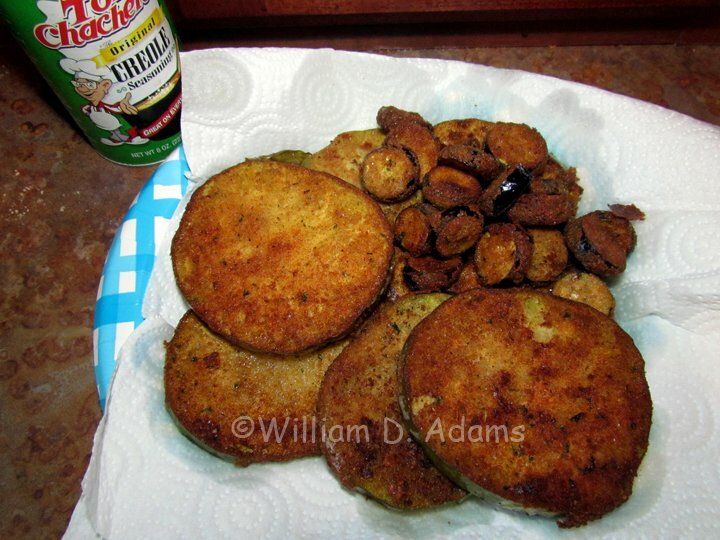 Slice the eggplant into ¼“thick pieces, dip in the egg/milk mixture and then dip in Italian bread crumbs (shaking in a plastic bag works even better). Fry in small amount of olive oil/corn oil until golden brown. 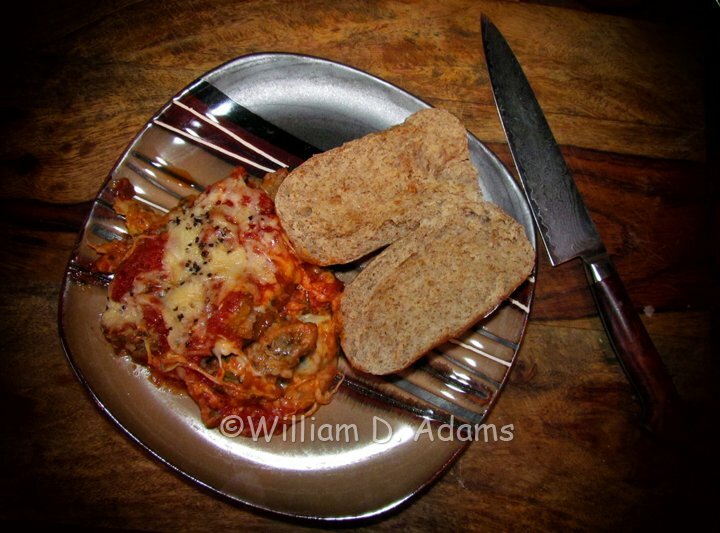 In a 9×9” baking pan (or disposable aluminum pans—and freeze some), spread a small amount of Marinara sauce, then layer the pan with eggplant (about 7 slices), ½ of the basil, 4 slices of Mozzarella, ½ of the meat, a light sprinkling of Italian bread crumbs, 4 slices of Provolone, ½ of the Marinara sauce, and ½ of the Parmigiano Reggiano cheese. Repeat with a second layering. Bake for 30 minutes or until bubbling hot. Heat up some crusty artisan bread in the same oven and add an Italian style salad with homemade Balsamic Honey Vinaigrette dressing (see Bill Adams- Texas Salad Garden blog), a glass of Chianti or your favorite red and call it a “Good Day”! 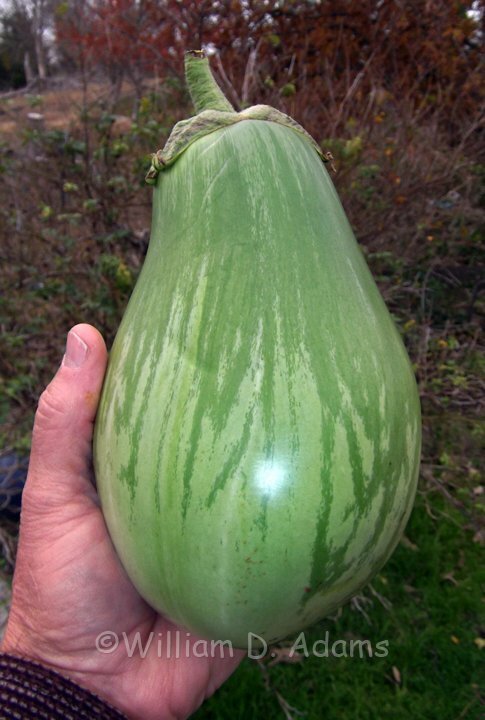 I am searching for seeds for my favorite eggplant, Louisiana Green Oval. Where do you get yours. Thank you! Hello Mary, Thank you for your question! We carry the Louisiana Green Ovals in the Spring, however we do not have a source for the seeds. That's wonderful! Isn't it nice to get good food for a great price. I can go to my MIL's gadren and get things. :)I have my own, but she has different things so we share, but I often end up with the better end of the deal.